A hint of light blue in an all white canvas is just enough to make a statement, just like in this ring from Apples of Gold. The three stone setting focuses on the lovely round cut aquamarine gemstone, which measure 3.5mm. This exquisite gemstone is accompanied by two glamorous white diamonds, which are also round cut, and measure 0.15 carats each. The pristine look of this ring is continued with a white gold mounting and band that offer simple but beautiful support to the stones. Also available in 14K Yellow Gold, 18K Gold or Platinum by request. 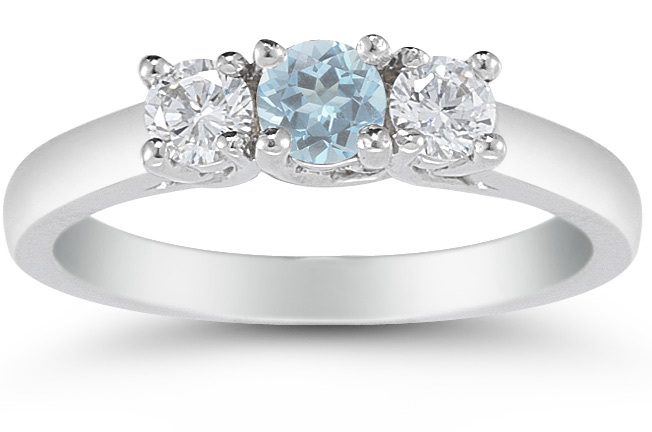 We guarantee our Three Stone Aquamarine and Diamond Ring, 14K White Gold to be high quality, authentic jewelry, as described above.